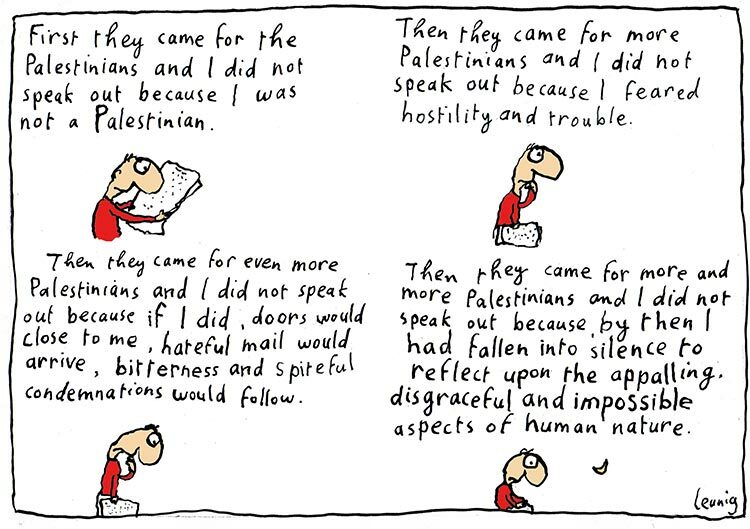 Australian cartoonist Michael Leunig posted the above cartoon on his site about the Israel Palestine conflict, referencing Martin Niemoller's poem 'First they came.' The cartoon, which is clearly pro-Palestine, has drawn accusations of antisemitism on Leunig's part. He responded to the claims in a lengthy article in The Age, some of which is quoted below. His thoughts on the role of the artist are of particular interest. Art is always narcissistic to some extent, but it seems to me -in current cartooning and comics especially- art is less about society, politics and representation, but ever increasingly focused on the individual. 'It has been publicly inferred that I am anti-Semitic because of a cartoon I created expressing sad dismay at the plight and suffering of the Palestinians in the recent bombardment of Gaza. My cartoonist's duty and conscience compel me to focus on the plight of the subjugated, the ones most neglected, severely deprived and cruelly afflicted. I am not against Israel but I am opposed to what I regard as its self-defeating, self-corrupting militarist policy, which is not only excessively homicidal and traumatising but sows the seeds of irreversible hatred and can never bring a lasting peace. One expects more from a prosperous democratic country. It's as if this young nation Israel has not yet come to maturity; so delinquent, irresponsible and unwise are its actions. The work of the artist is to express what is repressed or even to speak the unspoken grief of society. And the cartoonist's task is not so much to be balanced as to give balance, particularly in situations of disproportionate power relationships such as we see in the Israeli-Palestinian conflict. It is a healthy tradition dating back to the court jester and beyond: to be the dissenting protesting voice that speaks when others cannot or will not. You can read Leunig's response in full here.